Hall, M.Jr, & van Lint, J.H (Eds.). (1975). Combinatorics, part 2: graph theory; foundations, partitions and combinatorial geometry (2nd rev. ed.) 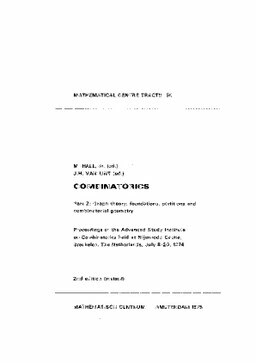 : proceedings of the advanced study institute, held at Nijenrode Castle, Breukelen, The Netherlands, 08-20.07.1974. (M.Jr Hall & J.H van Lint, Eds. )MC Tracts. Centrum Voor Wiskunde en Informatica.